It seems counterintuitive, but over the eons, glaciers may have made Earth warmer, according to a Rice University professor. Mark Torres, an assistant professor of Earth, environmental and planetary sciences, took a data-driven dive into the mechanics of weathering by glaciation over millions of years to see how glacial cycles affected the oceans and atmosphere and continue to do so. Torres, who joined the Rice faculty in July, is lead author of a paper in the Proceedings of the National Academy of Sciences. He wanted to know how and when chemicals released by weathering of the land reached the atmosphere and ocean, and what effect they have had. The study shows that glaciation, through enhanced erosion, probably increased the rate of carbon dioxide released to the environment. The researchers determined enhanced oxidation of pyrite, an iron sulfide also known as fool’s gold, most likely generated acidity that fed carbon dioxide into the oceans and altered the carbon cycle. The oscillation of glaciers over 10,000 years could have changed atmospheric carbon dioxide by 25 parts per million or more. While this is a significant percentage of the 400 parts per million measured in recent months, present anthropogenic carbon dioxide release is occurring at a much faster rate than it is naturally released by glaciation. 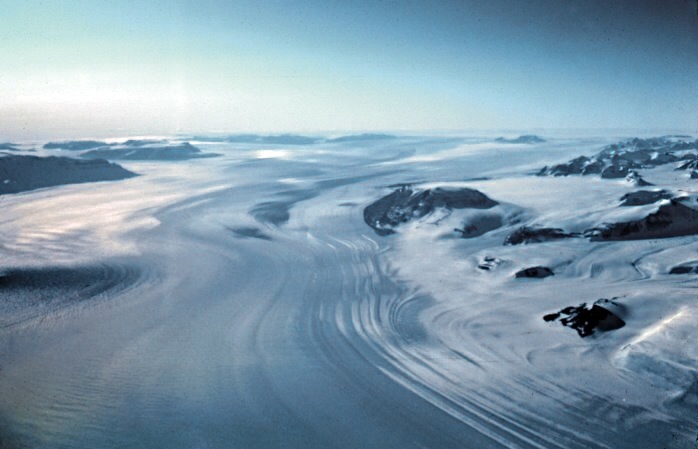 Over long timescales, they found, glaciers’ contribution to the release of carbon dioxide could have acted as a negative feedback loop that may have inhibited runaway glaciation. Glacial runoff appeared to have an outsize effect on carbon dioxide levels compared with that of rivers in warmer climes. Torres, until recently a postdoctoral researcher at the California Institute of Technology, studied glacier-fed rivers and used existing databases to compare their chemical contents with that of thousands of rivers around the world. The goal was to evaluate the dominant chemical reactions associated with glacial weathering and explore the long-term implications. The researchers acknowledged that glaciers are equal-opportunity weathering agents, as they also break down silicates in rocks. Silicates release alkalinity that removes carbon from the atmosphere. Still, they believe the net effect of glaciation could be to supply carbon dioxide to the atmosphere rather than to remove it. The results support a couple of interesting additional theories. One is that billions of years ago in the Archean eon and Paleoproterozoic era, when the atmosphere contained little oxygen, Earth may indeed have been a “snowball” as oxidative weathering in glaciated regions and the subsequent release of carbon would have been less active. Another is that the growth of a sulfide reservoir in Earth’s crust over time may have helped to stabilize the climate, which is important for maintaining Earth’s habitability over geologic timescales.